This film is a part of a Double Feature with Double Indemnity. When two movies that are screening in the same theatre are grouped under the same thematic heading, one ticket is good for both features when viewed back-to-back on the same day (except as noted). Humphrey Bogart, Mary Astor, Gladys George, Peter Lorre, and Sydney Greenstreet. Thanks to the masterful work of John Huston, this classic film noir has thrilled and captivated audiences for 75 years. 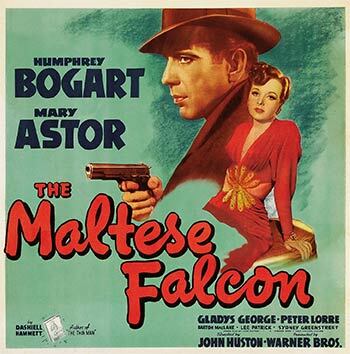 Bogey is Sam Spade, one of literature’s most beloved private eyes, who gets tangled in a web of intrigue as he tries to solve the case of his murdered partner. What’s at stake? Oh, just the stuff that dreams are made of.